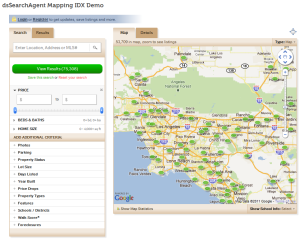 Optimize your website to engage more prospects and potential home buyers with our mapping IDX search and convert more of them into leads and paying customers. Live syncing lets buyers instantly see changes to their search results each time they change the map or their search criteria. Optional school makers and school district outlines help buyers see where the area schools are, as well as local school ratings. Combine listings from multiple data feeds in a single search interface with co-mingled results (where available). Optional sold listing search makes it easy to see the prices of comparable homes that have recently sold (where available). All registration and listing update emails are fully customizable with your contact information, logo and/or full HTML editing for advanced branding. Add your own custom fields, check boxes, and questions to your registration form. A single line of HTML code is all you need to add to your site to get started. Your free trial gives you access to all of Diverse Solutions tools and customer-only resources. Click here to get started with your 10-day Free trial today. Note: Most MLS rules won’t allow us to give you access to their IDX feed data until they have approved an IDX data agreement for your account, so most of our trial accounts include a sampling of fake listings in California and do not include any live listing data.